If there’s one group of people that constantly provide frustration to my working life, it’s financial analysts. In my role, running TodaysiPhone.com, I come across them a lot. Normally, they’re making crazy predictions about what Apple’s going to release next or daft predictions on the company’s financial results. Normally, they’re wrong. But that’s not what frustrates me the most. As a financial analyst, the focus is never on what really matters the most: The consumer. If what a company’s doing isn’t going to create financial growth at a stupendous rate, it’s deemed a bad move. According to Reuters, Wall Street is now concerned by the recent moves by U.S. carriers. Particularly T-Mobile. Having gone on the offensive in 2013, Tmo’s Uncarrier movement has stirred knee-jerk responses from its competitors. AT&T’s recent attempt to lure Tmo customers away with the promise of up to $450 and Sprint’s new marketing campaign to attract families are of particular concern. If Verizon also responds, it could mean a drop in profits across the board. Reuters also goes on to note that these analysts hope that Verizon and AT&T “shrug off” T-Mobile’s moves since they control over 60% of the market. With T-Mobile continuing to expand coverage, and offering the best deals on the market, I’m sure Tmo’s hopes are along the same lines. If the big carriers don’t respond, it’ll leave T-Mobile attracting even more customers than it already has. For me, a measure of a company’s success is a lot to do with customer happiness and – of course – profit. With T-Mobile bringing in so many customers every quarter, its own profits will go up. When a company’s main focus is pleasing Wall Street, customers inevitably end up unhappy. And, it is rather typical that when one company seeks to change an industry well-known for its lack of regard for the customer, that the analysts get “worried”. As explained by T-Mobile chiefs during the interview at CES (after the keynote), the average ETF buyout is around $150 per line. Most customers are quite far in to their contracts, and so there are very few requiring a the full $350. And, since the deal requires a trade-in, which is guaranteed to make Tmo some money, there’s very little need for any analysts to show too much concern. 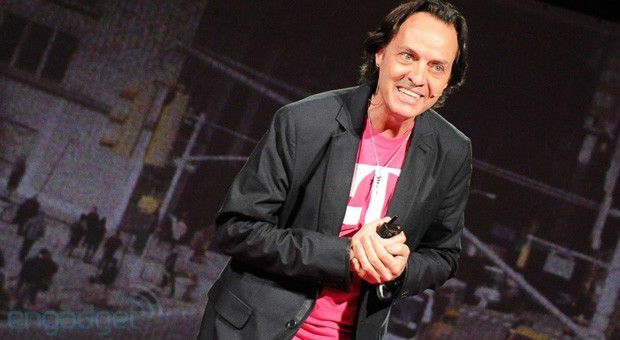 John Legere may not come across as the typical, pretentious business-man, but you only need to listen to his responses to questions on profitability and financials to realize he understands it just as well as any suited-and-booted CEO. Bottom line: It might not be good for Wall Street, but T-Mobile’s moves to change the industry have been much-needed in the industry for years. I don’t put much stock in what financial analysts have to say, because in my opinion they’re just one notch above psychics. They’re paid to pretend they have some crystal ball about what will be when they have no real clue. John Legere answered the question many times about this at CES and after, and if he says the financial math makes sense of paying ETFs – I believe him – Especially when you consider it’s one payment they’re offering in exchange for at least 2 years worth of revenue per line(and most likely much more). Absolutely agree with u ! Meh. That’s all I have to say to them. I just switched 2 lines myself. Check out his twitter feed, people are not joking, they hate other carriers fo real. No worries. All they have to do is to sell off their stocks in AT&T and Verizon (or all telecoms). It’s now “unprofitable”. Good luck with that. wtf? Just because competition is working the way economics of free-market intended, they now cause fear in financial markets? I borrow the very words of John Legere. These “analysts” are STUPID, BROKEN and ARROGANT. That’s why stock dropped 53 cents today. Freakin’ annoying. The stock is also up $7 pure on M&A speculation so it works both ways. I don’t think releasing the 8K without financial outlook helped. Merger and Acquisition speculation (Softbank and Dish). Every carrier lost big today, but Sprint was the one that took the biggest hit. Considering Softbank is investing $20bln in Sprint, but yet the intend to deploy Spark to only 100 million people in 2014, their stock should go down! What is going on with the $20bln? Sprint isn’t aggressive at all. Wall street can say whatever they want for T-Mobile to this and shake up the wireless industry was a good thing for it to be the same for the last decade and charge the customer more for less wall seem to scared to lose profit money in their pocket. I’m happy to with T-Mobile for 10 years and for what they did. I’m not lock down to a two year contract I can upgrade whatever I want after I pay off my phone and save after it right now I’m only paying 75 dollars for unlimited text and data u can’t not say no to saving. If I was with Verizon,att,sprint I would be the same amount after my two year contract is over. Yeah you pay for what u get and T-Mobile had spotty coverage and their fixing it in 2014 so I can’t complain. The financial analysts don’t have the consumers’ best interests in mind, they have the consumers’ dollars in mind. They get paid to analyze revenue and profits; I don’t think that this is a bad thing. Blogs like this are for consumers’ interests. Both have their place in the world. Cell phone service is bound to drop in cost. It is simply the trend. We saw the same thing years ago with long distance. It used to be an excellent deal to get .10 per minute long distance. Now, in many cases, we pay no long distance charges. With cell phone companies, they are able to lower prices because their operational costs are getting lower. Most of the cost savings have been due to the switch from TDM type transport (meaning each call has a dedicated circuit) to IP based transport. This results in millions of dollars in savings every month for a company like T-Mobile. It’s about time this happens. Carriers in the US have been ripping people off for too long. If anything the one racking up the profits will be T-Mobile while the others fall, it’ll just be money going from one pocket to another. I hope Verizon and AT&T respond to T-Mobile’s attacks, because it’s for consumers interests. If not, T-Mobile will easily rise to the top smiling all the way to the bank. From the source article I just worry these same ‘analysts’ will be pushing for Sprint to buy T-Mobile in order to stop lowering profits. Hopefully the big 3 don’t petition for this just to take the winning underdog out. Oh honey u haven’t been to Mexico huh? Over there they RIP u off I had to go for 3 week’s to take care of my sick grandma ,Telcel is horrible worse than Verizon att, Sprint They have prepaid and postpaid on prepaid amigo kit I put 400 pesos which is about 40 bucks on my nexus 5 I fixed apn settings had no data I told the girl I wanted data to access Facebook ,Twitter, check email etc she said 300 pesos more which is like 30 bucks for 500 mb of data yes 500 mb for 30 bucks ridiculous, I asked to look at there postpaid prices 750 pesos a month which is like 80 bucks 90 mins,40 texts, less than 1 gig data Ridiculous too, I’m glad I’m back in the US I thought prices were expensive here now that I think about it were lucky here I feel bad for my cousins in Mexico.. Your conversions were a little off, 400 pesos is approximately $30 but wow, that’s still crazy. In an older post Melissa Cardenas said she left to join AT&T, so she wasn’t able to take advantage of the T-Mobile benefits. Instead, it was probably cheaper to do what she did, since AT&T will do almost anything to take your money, save from reaching into your pockets themselves. These Klowns have nothing better to do than MAKE UP data that they can feed the rest of their community as fact.. It’s ALL lies, hand-waving, mis-direction and BS…. Ignore them, they will tear each other up in the arena and leave you alone…. Wireless margins have been around 90% for voice and over 65% for data. Analysts always get worried if margins fall not because the company is in trouble but rather because the insane profits are no longer attainable. Company’s like Verizon can only afford to buy other company’s out like Vodafone for $130 billion due to these insane profits. I’m not against making profits. In fact I’m all for them. I am however against consumers getting gouged just because company A or B is worried about losing a little profitability. Well put. Also of course the concern is can T-Mobile truly win a price war they start? I have seen Legere address this twice now with confidence they can hold their margins. Once again, the pre-announce without the financials did not help. This is what we desperatley need in the broadband and cable industry. Thanks Mr Legere and T-Mobile. Typical Wall Street b.s., lets see when T-mobile shows how many new subscribers they got from the “Big Three”, how much profit they lost. tmobile has said that whether the big two respond or not, they will have changed the industry for the better. Once verizon and at&t lower prices, they cannot raise prices again (after hurting tmobile) without looking EXTREMELY bad, not to mention invite ant-competitive actions by govt. Also, tmo has said that they can operate on much lower margins than the other two. I would be surprised if tmo doesn’t report profits in Q4 after adding 1.6 million customers. This is including their current capex rate. For spectrum holding, they will incur debt as they have shown the inclination. If verizon can borrow 100s of billions of dollars to buy themselves, why can’t tmo borrow another 5b for spectrum ? Unfortunately, remember ‘Share Data’? they raise the prices right on our faces. i thought Verizon was gonna be done for but apparently people liked those commercials with the floating gadgets. If or when V. fires back at T-mo and the damage is done (or not…V.Edge hows tha working?) they’ll come up with something worse, “Pay day phone loans only from Verizon.” So no, they never care if they look bad, they will find a way to screw u.
Yeah as full disclosure I’m a shareholder of TMUS from $25 and $26 range and also a 4 line customer even though I’m in an area where my primary signal is Edge even though I could have solid LTE through V or AT&T. Not trolling. I saw Legere address this re: their operating expenses twice last week so I doubt he does that if they aren’t going to be in line. I agree it seems to me their plan is build their customer base, which then gives them flexibility for additional capital raise for the 600mhz auction. However I do think it is odd for people to be mad at these “analysts” right now and say “typical wall street” as the stock is trading extremely rich right now and this benefits the employees as much as the shareholders since Legere gave them all stock. full disclosure- I have been investing in the stock market(US and overseas) for a long time, not in tmobile. Yes, wall street is an organized white collar crime syndicate. Speaking from first hand experience. I have seen the games they have been playing in trading alone. But don’t take my word- just read up on facts such as how they are bilking taxpayer money to the tune of trillions, siphoning it off overseas, then printing more money in the treasury, rinse repeat. We didn’t get 16 trillion in debt due to social security- thats a lie. It is too complicated to explain here, assuming you have the wherewithal and inclination to understand but the results of their actions are for all to see. What’s up with these analysts, are they shills for the big companies or what? People spending less money on their phone bills means people saving more money, and having more money to spend on other things – less money being concentrated into a tiny number of super powerful megacorporations (AT&T and Verizon), and more to spread around in general. With just about everyone needing a cell phone these days, aren’t lower bills offered by T-Mobile better for the economy overall? If T-Mobile can keep the current momentum at chipping people away from others, they habe nothing to worry about. All they have to do it keep investing in LTE and bringing more and more towers up to speed. Precisely… If they just repeated exactly what they did last year regarding LTE on 1700 mhz. (So exactly double the amount of towers covered), along with continuing developments to Uncarrier – They will accumulate another 6 -7 million or so customers over the course of this year. putting them solidly in third position ( I expect Sprint to continue hemorrhaging customers in 2014 and not rebound until 2015). 2015 is going to be the make or break year for tmobile – They have good momentum and need to keep it. They need to continue expanding coverage of LTE and quadruple their LTE map (at a minimum) in the next two years to continue this amazinig run they have been on. Not sure what you mean by “quadruple their LTE map”. It is already said to cover 209 million POPs and the total population is around 314 million. The TM network is delivered over around 52,000 cell sites and the current network modernization program has already reached over 30,000 of them. The original program targeted 37,000 sites covering 225 million POPs. The thing is that the vast majority of potential customers reside in the areas that TM have already modernized. If you assume that most of their current 46 million customers are already in those areas then the remaining target is 229m less 46m = ~183m. The rest of the population altogether is 314m less 229m = ~85m. In other words, less than half of the potential from their existing 3G/4G markets. While I expect TM to continue expanding their 4G footprint in suburbs and along main corridors between major population centers, I doubt that they will begin an aggressive program to bring LTE to the remaining ~15,000 cell sites in 2014. They will steadily replace tower equipment as part of the normal maintenance program, but won’t necessarily match the backhaul to the full spec of the equipment. If they had been planning to do more than this in 2014, they would have said more about it at CES. Instead they teased “going faster and LOUDER” which was all about adding 20+20 wideband service in existing broadband markets to offer true 4G service with downloads in excess of 100mbps (eg. 147mbps tested in Dallas). The “louder” part is to be achieved by adding 700MHz service mostly in areas that are already served by 3G/4G. It would be nice if TM continued to roll the modernization program through their full network, but they haven’t indicated that will happen and their growth expectations are based on optimizing the customer base in the areas that already receive their best service. Look on sensorly… The size of that network (square miles covered) needs to quadruple at minimum in the next two years. They need to double the AWS footprint in 2014. (Which is possible with tower upgrades – if you look on the 2g-3g map) and in 2015 double that total footprint with 700A + (spectrum auctions). Suburbs of cities need better coverage. And they need an lte presence in all of the top 200 markets. There is no sign this growth is planned in a structured way outside the suburbs and the top markets. Objectively, it makes no sense to spend a dollar on expanding rural coverage if that dollar can produce more revenue when it is instead spent in urban areas. When you move outside the suburbs, population levels drop rapidly to a few hundred per square mile and then a few dozen. The cost of provisioning a cell site is greater in real terms in those areas and the return on investment is never likely to cover the cost. Verizon have been able to do it because of their massively greater revenue and disposable reserves, and because, as the first and only carrier to blanket the country in that way, they gain a marketing advantage from the message, even when selling to people who will never need that coverage. TM on the other hand have to be much smarter about how they spend their money. Since they are still coming from behind in even their best markets, because of the limitations of their spectrum capabilities, it makes more sense to spend their dollars on improving the direct day-to-day experience of the current and potential urban customers by deploying sub-1GHz spectrum and optimizing speeds than by offering them better coverage during their occasional trips out of town. Until there are signs that these markets are tapped out, they will remain the primary focus of TM investment. this is what i am advocating… doubling their footprint (and the only footprint i consider is LTE), basically means covering the cities and their respective suburbs (right now tmobile covers most cities) but not most suburbs.. Rural coverage will have to wait until 700mhz spectrum is available and deployable. In those markets where there is no channel 51 issue, the availability of 700MHz A block spectrum will offer a dramatic and immediate improvement in suburban coverage because of the extended range compared with PCS and AWS. Again, I’m very fortunate that I stand to benefit immediately because the Verizon licenses cover my area and there is no channel 51 broadcaster to delay deployment. Even without the 700MHz licenses, I am expecting that the next ring of towers outside the suburbs here will be seeing modernization fairly soon. Most of the arterial roads heading into the city will have fiber service, so the next step should be quickly possible. I do think that some ad hoc rural improvements will come in areas where failing equipment has to be replaced. They will install the new hardware which can make use of the available AWS spectrum, but they may not be able to deploy fiber on the same timeline. One option might be to add bonded T1 backhaul to be able to support 3G/HSPA service where only 2G is currently available. I’d rather have that than nothing. I am enjoying reading your intelligent responses. Would like to chime in and say that my ideal TM will include all major interstates with at least 3G service if not HSPA or even LTE. How many road trips through Illinois, Iowa, and Michigan that I have gone and saw only GPRS on my phone. I have my hopes that I can stream music I my car without relying on offloading on to my phone. Of course, it should go without saying that I would prefer to be wrong about things like this. While I think my conclusions are sound and logical, based on all the available knowledge, it would be much better for everyone, if TM could somehow find the capital to fund the rural build-out, in addition to their current plans. Not necessarily, if the overall impact of the changes that TM are forcing through reduces the overall profitability of the industry. As others have pointed out, the analysts are looking at the overall “health” of the industry from an investment revenue perspective. If TM’s increase in revenue doesn’t equal the reduction in the revenues of the other major carriers, then the overall profitability of the sector reduces and the analysts will continue to twitch. Such an outcome is entirely possible because the market has reached saturation point. There are now more wireless contracts than the entire population of the country, and the changes are driving out anti-competitive market regulators such as contracts that work exclusively in the favor of the vendor. Until the industry finds the next service kick-off point that allows them to charge for a new layer of functionality, profits across the industry cannot grow by overall volume of sales. As operational overheads have already been trimmed aggressively, addressing the other variable in the equation, reduced prices ultimately spell reduced profits. There are several different ways of looking at this overall situation. When I talk about what I think the analysts will or won’t do, it is from the perspective of what analysts are supposed to do in respect of the current economic system. Thus, I say that they won’t be silenced, if change reduces the overall profitability of the wireless industry. That’s a completely different perspective from that of the consumer, who has certain expectations within the boundaries of the current economic system. However, when you ask for an opinion about a corporation like Verizon being able to spend $130 billion buying out its former partner, then it shifts into a broader political critique. Do I favor an unfettered market economy which allows corporations to accumulate such profits? That’s a whole other discussion, which I won’t go into here and now, other than to say it’s probably not crazy, if you’re part of the top 10% who own over 75% of the wealth from that system. problem is the wireles industry is operating at 40% – 55% margins. Tmobile is looking to operate at 20% margins. They are profitable but not as heavily as Verizon or AT&T. Legere wants to be a “fast follower” meaning he is always planning on being #2 (like pepsi) but it enables him to do things cheaper and over the longer term. Which is why, if the rest of the industry responds in the way anticipated, the overall profitability will reduce – despite TM becoming much stronger – and the analysts will continue to say it’s a bad thing. So to be clear, there are no current T-Mobile phones that will be able to work on the 700 Mhz A block spectrum? Sorry If i’m repeating the question. Yes, that is correct. Look for the first T-Mobile devices that support band 12 to come late this year. Late this year? Surely the S5 will have 700 support! And it isn’t coming out “late this year”. That is if T-Mobile requests Samsung to include the needed hardware changes to pick up the signal. They may not want to make the changes if it adds to the cost of the phone when the purchase from Verizon hasn’t even been approved by the government yet. Granted there may be nothing to negatively impact the decision, anything is possible. They could also sell a refreshed version later in the year that can pick up the 700mhz. Didn’t they do the same with the S3 when the LTE network was rolled out? Probably only a baseband(software) change will be needed. That would then imply the hardware in the new S5 would be compatible from the get-go if it only needs a software update to activate. Either way it’s all speculation until Samsung actually releases the information for the phone and then goes on to release the information for the customized version that would work on T-Mobile. There is no doubt the 700mhz spectrum will be given to tmobile. I don’t see it being blocked either but things can happen between now and then. The Xperia Z1 will be able to. I am waiting for Sony Xperia ZU successor with band 12 LTE. Until then, I use Note 3. “Financial analyst” is fancy language for “greedy slug who wears a suit and works in lower Manhattan”!!!! How can gaining 4.4 million customers in ONE year possibly be a bad thing? It is a bad thing if you cannot make money on those 4.4 million customers. I have no idea if this is the case, but anyone moving at 350/line probably exceeds what T-Mo will get in the first year. Don’t worry, they’ll make it up. I just received my Tmo post card notifying me that my employee discount is being discontinued. Your probably one of those annoying customers being rude and wanting everything 80% off, I wouldn’t get anything right for you either. Because who works at Tmobile? Not me! I’m a wage slave for a large organization that was previously given a small discount for signing up with Tmo. In response to your attack on service reps, I partially agree that there some bad ones out there, but on the other hand look at how much they’re paid and all the crap they have to put up with. You’ve never been one for ASSumptions taron19119, have you? What was the reason your account was suspended? Financial analysts don’t care about the consumer, nor should they. They look at it from an investor’s perspective. If you were looking to buy Tmobile stock you would have to have some concern about a company basically paying people to come to their service. It was seen as a desperate move when Sprint did it 3-4 years ago on TmoNews but now that its magenta its a great move? The fact is that the market is saturated, the growth of people signing up for new cell phone service is done. Everyone has one and there aren’t enough young people getting their first phones every year to make up for it. Its why subsidies on phones are no longer profitable and why all the companies are nickel and diming customer for extra data featurea and ancillary features like family allowances, web guard, and caller tunes. I miss David on this site, he used to present the news with a fair approach. He liked Tmobile but wasn’t blinded by the fanboism. He told it like it was. These new cats seem like shills for Tmobile and an article pooh poohing financial analyst for doing their job just because they are not singing magenta’s praises is a great example of this…..
Actually, if you had watched the interview of John Legere a couple of posts back, you would have heard that this offer to “buy” customers out of their contracts is doing two things: 1) The obvious: getting rid of contracts and allowing people to try T-Mobile. 2) It is providing an option to gain customers at a lower cost per subscriber than the industry average today. The industry is saturated, so that causes the cost of each subscriber gain to rise. T-Mobile is causing a benefit to not only the customers, but themselves as well since this offer is undercutting the industry average to gain that customer. Have you noticed T-Mobile isn’t spewing tv ads all over the place? They spend their marketing money wisely and use that savings to pay for these switches. And it’s very sustainable as well since these people will need some type of EIP that are signing up. They can pay it off as soon as they want to drop their bill, but on the business end, that will provide a way for T-Mobile to ensure these customers who are getting paid to switch aren’t screwing T-Mobile over and leaving. It’s literally a win/win and if everyone realized that T-Mobile is not only saving the customers money, but saving themselves money for each customer gained, we wouldn’t be having this discussion. Yes, shrug it off. Ignore the great moves that Magenta is implementing to move forward in the game. Don’t worry about the Magenta taking your customers and changing the rules of the cell carrier game. Shrug it off, and turn a blind eye. That way, you won’t see when T-Mobile is about to pass you. All this tell me is that a bunch of greedy fat cats-didn’t Wall Street collapse and caused major issues across the US-are saying they don’t like change. Pft, as if that ever stopped anyone. Informed consumers should research the best deals and follow that conclusion to a carrier. For me, Magenta offers what I want. Seeing the other 3 immitate, and even try to get a jump on T-Mobile’s plans, is entertaining and shows the waves Magenta is making. For me, I’m saving ~$55/mo by being on T-Mobile when I switched. Going back to VZW will cost more and I expect AT&T to have nearly the same cost premium. Even with a free phone, I don’t see a reason to leave T-Mobile. T-Mobile’s “fair play policy” finally works and it works rather well. It was not like Even More Plus which did not cut it. Legere successfully makes a lot of noise and draws a lot of attention. I never seen that for 10 years (2003-2013). Now it’s time to take back “Get More for Life” motto. ..You’re coming to an unlimited data network and you’re scared of using 5GB of data a month? If T-Mobile truly wants to go the “un-carrier” route, they need to remove all of the their apps off the phones and have them in the app store, a la carte for Android of course. iPhones do not have this issue. Doing so will allow for a faster and more direct updating process by the phone manufacturer. We (T-Mobile) don’t really have a lot of carrier based apps anymore. There are the typical ones such as Visual Voicemail keychain, support etc.. However, if you compare what comes preloaded with the stuff that the phone manufacturers load, its almost incomparable! Kinda hard to do with WiFi calling. Does anyone even listen to these annal-ists? I remember when they were saying back in the year 2000, not to buy gold because it has been practically worthless. If I had ignored them then, I would be buying low and selling high now. :-D Why do we pay them any attention at all? 80% of the COUNTRY IS living in an Urban area(ie: Metro area) T-Mobile covers THOSE folks. Anyone paying MORE than T-Mobile is charging are just plain stupid OR they just like paying MORE for LESS. 3 Smartphone lines and UNLIMITED EVERYTHING with NO throttling of DATA for 159.00 Plus taxes Is a NO brainer, at least for ME. It is somewhat beside the point of the article, but the reason you state are exactly why I think it is a bad move for a customer.. You’re being asked to give up a $300-400 phone, in exchange for a $150 etf payment. That initial deficit may not be worth the hassle of changing before the contract ends. I’m sure some will trade in a phone that isn’t worth $150 (if possible) and the others may pass. I do agree with the rest of the article though. As a Sprint customer, I hope the fed doesn’t allow this on the basis that the industry becomes less viable with four carriers. One former federal regulator overseeing the potential ATT/TMo merger (now in private practice) speculated that the fed might allow #3 and #4 to merge this time around. “Analysts” are the same morons that manage to get paid for spewing completely ridiculous garbage about Apple every quarter too. You know the game. “Analysts predict Apple will sell X million widgets. Apple sells just under X, and these idiots proclaim that Apple is dying, failing, losing its edge, or whatever else they can to cover up the fact that they just pulled arbitrary numbers out of their booty region. The stock price does something (usually drops) and they can buy some and cash in when it goes right back up. Now they’re just adding T-Mobile to their spewage as well. Ignore them. They’re suit wearing Wall Street twerps that have one goal – squeeze as much short term “shareholder value” out of everything that they possibly can without any regards for the future. These are the same types of short sighted greedy fools that helped to squash Verizon’s FIOS rollout. Not enough short term gains ($$$$) for them! Now it’s 5 years later, and FTTH is more desirable than ever. I think that what T-Mobile is doing is a good thing. Expand LTE, hopefully cover some more of these outlying areas and especially highways, and have decent customer service with minimal headaches.